FILE- Female workers sort shrimp at a seafood market in Mahachai, Thailand, Sept. 30, 2015. Two American importers missed a federal judge's deadline for responding to a complaint by seven Cambodian laborers allegedly exploited while working in Thailand’s seafood industry. A law firm representing the five male and two female plaintiffs filed a complaint against the four companies on June 15. The Cambodians were recruited from their rural villages by a local agency to work for Phatthana between 2010 and 2012 and became victims of “human trafficking, forced labor, involuntary servitude and peonage,” according to lawyers at the firm Cohen Milstein, which specializes in human rights and class-action cases. When contacted by VOA's Khmer service, a woman who answered the phone at Rubicon in Culver City, Calif., said the company had “no comment on that.” The woman declined to give her name and refused even to confirm whether the company was aware of the complaint. According to court documents published online, a summons was served to Rubicon on June 28. The firm’s chief finance officer, Harry Kraushaar, is recorded as having received the document. The summons and the complaint were also translated into Thai and delivered to the two Thai companies. S.S. Frozen Food was served on July 12, with a K. Warin signing off on the delivery list. The company is based in southern Thailand’s Songkla province. Phatthana was served on July 11. “If you fail to respond, judgment by default will be entered against you for the relief demanded in the complaint,” wrote court clerk Kiry Gray in a summons dated June 24. FILE - Migrant workers unload frozen fish from a boat at a fish market in Samut Sakhon province, west of Bangkok, June 20, 2014. The workers’ shelters would flood during rains, he said, adding that workers would sometimes be kept up all night, draining the water from their quarters, before working long hours the next day. Shocking levels of exploitation in Thailand’s seafood industry have been exposed by journalists and human rights advocates in recent years. 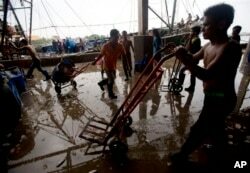 The industry benefits from the copious supply of cheap labor that comes to Thailand, mostly from Cambodia and Myanmar. Thai government officials and police have been implicated in human trafficking, according to reports by the U.S. government, human rights organizations and media outlets. “For one, the company on site knew because the men [and women] complained and wanted to go home,” she said. “Two, there were so many reports and investigations over time by the United States State Department, by Human Rights Watch, where we have 15 pages of evidence of all these investigations that highlighted the problem in this industry. “One of the things that we think we will be able to prove is that the companies in the U.S. should have known that people are being trafficked,” Fryszman added.